'You walk out of Mukkabaaz feeling good about yourself, but unlike Kashyap's best pictures, it releases you from the responsibility of seeing yourself in it; the movie is darn clever, most of the way, but it hardly has any wisdom,' says Sreehari Nair. Anurag Kashyap has finally made a movie that most people can walk out of, feeling good about themselves. Those who had, in the past, accused him of being too dark and too edgy will sense in Mukkabaaz much darkness but also the comfort of darkness being dispelled by force. Those who had read his art of 'solving denseness by adding more denseness' as a sign of his infantilism ('he is like a kid who, upon getting his first box of crayons, winds up making a mess of the walls,' an acquaintance had once declared), may very well think he has matured as an artist. And many of those prissy liberals who see Kashyap as the man to take on all our societal problems (in reality, he was merely fighting his own fights), will believe he has made his most 'socially conscious' film yet. A big part of Kashyap's artistry, his techne, is his capacity for complicating our responses. You walk out of Mukkabaaz feeling good about yourself, but unlike Kashyap's best pictures, it releases you from the responsibility of seeing yourself in it; the movie is darn clever, most of the way, but it hardly has any wisdom. This might be the most politically correct Kashyap's ever been (and that's no compliment if you are a true artist), his most black-and-white venture yet, and is the first Anurag Kashyap movie in which the win-loss matrix is so straightforwardly defined. Mukkabaaz is Kashyap's most crowd-pleasing film after Dev D, and while there's enough inventiveness packed between frames, it is primarily a movie for the easy moralists. He has sold out in style. The basic story fits right into the seventies: Shravan (Vineet Kumar Singh), a Bareilly-based boxer with national-level aspirations spars with local strongman Bhagwan Das Mishra (Jimmy Shergill) as he tries for professional selection, and struggles to first marry Bhagwan's niece Sunaina (Zoya Hussain) and later to keep her. The boxer just wants to do the right thing; he has no cherries to pick other than ones that are within his reach. The land of his birth and its inherent biases are supplying him the rage to fight. Shravan is probably the most uncomplicated of Kashyap's protagonists; get him to share a bus-seat with Sardar Khan and he wouldn't last the ride. The first hour-and-a-quarter of Mukkabaaz is a breeze. With Prashant Pillai's lively score cutting right into the scenes, Kashyap de-stabilises the genre elements: the boxer outdances his opponents as much as he outboxes them; the strongman is impotent, his excessive pride and vanity, a direct result of his infirmities; and the girl is mute. Both Shravan's pursuit of his passions and Bhagwan's acts of villainy are consciously half-done, reminiscent of Manoj Bajpayee's playful seeking of revenge in Gangs of Wasseypur. Within the broad setting, there's always so much happening in the initial one hour of Mukkabaaz that it feels like a masala film drawn from life -- and that's awfully satisfying. Working with as many as four cinematographers (Rajeev Ravi, Shanker Raman, Jay Patel, and Jayesh Nair), Kashyap creates a whirlpool of pure love, evil, bad tastes, passions overlapping in passing, and verbal and visual slapstick. A conversation about Bruce Lee and his brick-breaking talent cuts to a question about his nativity. 'Bruce Lee's not from China, he's from Hollywood,' says Shravan with total conviction. One fact about Kashyap that often goes unmentioned is how, this most masculine of our directors, captures his women with such affection. In his pictures, we know we're constantly watching his vision of women, but it's such a fertile vision even when it turns into fantasy, that the lack of objectivity feels like a blessing. Kashyap shoots his women so that we catch their expressions, reactions, and emotions on the wing; he never gives his women speeches of the kind that critics, whose reviews read like an eighth-grade teacher's preparatory notes, can find relief in. Kashyap's women are for us to love with all their complexities, and here in Mukkabaaz , he gives us scenes of women with their men, women when they're huddling together, and when they're alone, and these scenes together help us complete them in our heads. An all-women dance feels so alive and so loose and is yet so carefully composed, that you can call out the steps that don't sync. Later, there's a wonderful scene of the womenfolk walking into a showdown between Shergill's Bhagwan Das and his elder brother, and slowly walking out -- a great shorthand for the gender equations in the state. Bhagwan Das is a despot -- worse, he's a despot without style -- and nobody hates him more than his niece Sunaina. In the way Zoya Hussain plays Sunaina, the word 'Feisty' doesn’t quite do it: She's like a ship in full sail. With a sterile tongue and subtitles to support her, Sunaina seeks solace in chewing gums, a cutesy character trait, but when, like Brando in Last Tango in Paris, she parks her gum on a wall, it also expresses her restlessness, her resistance to conformity. The film works fine until Kashyap has to get the plot moving, and even those who worship the director know that plot-movement is not his strongest suit. So he structures Shravan and Sunaina's marital life and Bhagwan Das's comeback around a series of political commentaries that simply manage to touch all the liberal bases. Casteism, Patriarchy, Feudalism, Beef Politics, Pseudo-Patriotism, he ticks all the boxes, but does not dare to explore the roots of one issue -- merely condemning them all from outside. The crazy integrity of the first one hour is given up for a show of integrity later; the movie doesn't sustain its quality of feeling. Ravi Kishan appears as Shravan's well-meaning coach who attempts to awaken the champion inside him, and both Kishan's speeches and his traumas gathered on account of his low caste, has the effect of an echo chamber. The character is easy food for the easy moralists. Anurag Kashyap completely works against his own drive, especially in a section set in Shravan's railways office, where the natural, poetic sparrings of the initial bits are replaced by punchline-belting. Kashyap plods through the scenes there because he has nothing more to offer than programmatic messages; there are no internal incongruities, and no real shading to give you any pleasure. Between checking all the boxes however, Kashyap and his writers allude to little lumps of irony that hint at the great film Mukkabaaz never turns into. It's suggested that the whole country is essentially a boxer's ring; there'a scene of Shravan's lower caste boss at the railways office recording a video of Shravan running errands for him and talking loftily about how the tide has turned for those from his community; a pre-interval shot of Sunaina's ex-suitor leaving her wedding scene with a wry smile; and there's the paradox of the feisty girl who gets her 'progressive husband', and with him a mother-in-law who shames her for her lack of 'domestication'. In a brief scene, Shravan Singh vents out his frustration at the menial jobs he's handed out, and bellows, 'I am no chaprasi', and a worker who's around to hear him, retorts, 'Bhai, isn't a chaprasi a human too?' Again, that scene works better as a straight comedy than as an expression of depth. Kashyap is terrific at inserting pulpy material at the most unexpected places, but is hopeless when he tries to create something cardinal out of pulp, something that simply isn't there. Vineet Kumar Singh is a fluid actor, fast on his feet, and moves in an unobtrusively natural fashion. 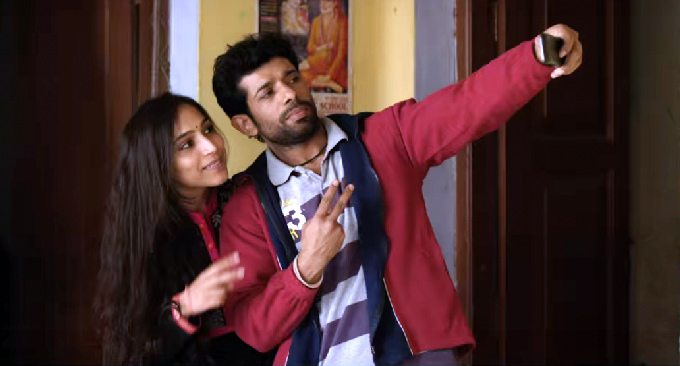 However, nothing develops in his Shravan and his best moment of acting occurs when he yells at a marketplace, in a husky, grunting voice after he confronts Shergill over the missing of Sunaina. Kashyap can't motor a plot effectively and here through his lumbering, he reduces the range of his characters. You feel like you know less and less about the people in this movie with every successive reel -- no, they're not mystical, simply underdeveloped. It's the two fathers in Mukkabaaz who stay with you the longest. Kashyap tightens his camera on Sunaina's dad (who dreads Bhagwan, his younger brother), as his entire family bathes in the gaiety of her oncoming wedding -- there's a dance happening around the man but his face burns with fear. It's a great moment and happens so quickly, amid all the festivity, that it shocks you. And then there's Rajesh Tailang as Shravan's father, an old-young man with his own, little grumblings and Tailang gives the character so much poise, there's so much life going on inside him, that he lights up every shot he appears in, simply by his presence. When his boxer son berates him for not believing in him, Tailang starts to the fiddle with a fan-blade, and it's both hilarious and oddly moving. Later, after a domestic inconvenience has set in, he draws up a metaphor full of nods to the British and Lord Mountbatten and you can't stop guffawing. Tailang's is the best performance in the movie and it's also a reminder of the tone it fails to carry on. Mukkabaaz then would have been a very good Anaand L Rai film, but as it stands, it's a minor Anurag Kashyap film. Kashyap is, I have always thought, an artist closer to those great men of letters; men who believed in bringing to you the salt of every experience. The most essayistic of our Hindi film directors delivers best when he's ready to play the bum, the clown, and when he cuts himself off uprightness; for he then becomes like our country, not very upright, and then he documents it better than anybody, without settling down into quick judgments. Here, though, he isn't being his generous self, and uses his gifts stingily. In fighting one evil man, Kashyap wants the boxer to fight an entire system of injustice. You can call that a plotting problem, but it could also be the dawn of a reductive cinematic approach. My worry is that many who are not fond of Kashyap's usual complex sensibility would like this latest move: They'll applaud the fact that he's going for the tear glands with brass knuckles on. The tragedy of Mukkabaaz is not that it aims low; the tragedy is that it aims low and hits.